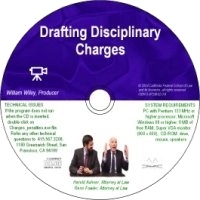 This CD-ROM training module helps the practitioner select and draft effective adverse action charges that will withstand review by the Merit Systems Protection Board and arbitrators. As the Board has become more legalistic in the interpretation of misconduct charges, these charges become more difficult to pursue. Few things can be more frustrating to the agency practitioner than to have a "guilty" employee returned to the work site with full back pay and attorney fees because of a poorly framed charge. Employment law attorneys Fowler and Ashner employ video clips and real life examples to explain the basics as well as the nuances of MSPB law. Topics include: anatomy of a charge, adequate notice requirements, charge labeling approaches, splitting and merging charges, charge selection and drafting strategies, and the top ten mistakes to avoid.